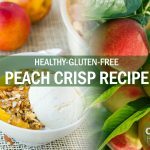 Although research continues to pile-up concerning all the effects that gluten intolerance has on the body, we know, from a study involving 30,000 patients and reported in the Journal of the American Medical Association, that gluten’s relationship to Celiac disease and cancer is certain as is its relationship to many other health issues. The data from the study was collected from 1969 until 2008. Divided into three groups, the patients either had Celiac disease, intestinal inflammation but not full-blown Celiac disease or gluten sensitivity. The results of the study indicated that those individuals with full blown Celiac disease had a 39% higher risk of death. The risk was 72% for those with intestinal inflammation, and 35% for those with gluten sensitivity. Cardiovascular disease and malignancy were the main causes of death in Celiac disease. 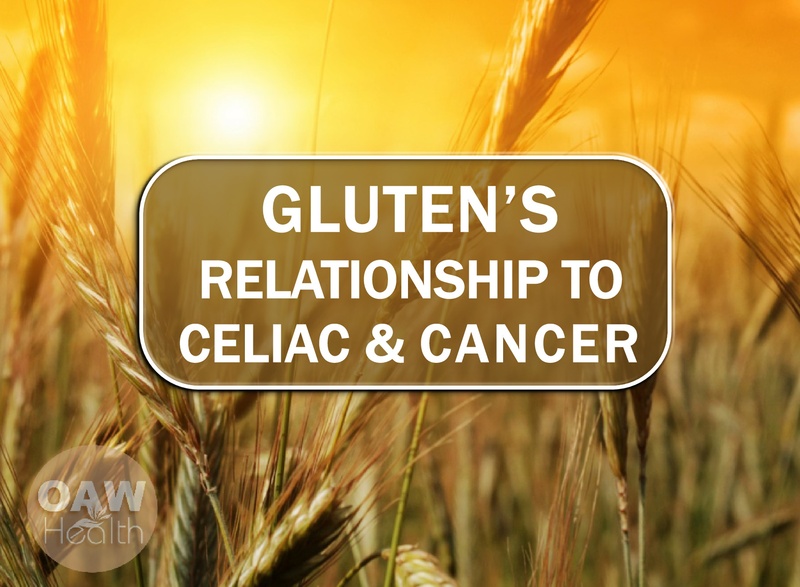 Let’s take a look at gluten’s relationship to Celiac disease and cancer. Many people suffering from gluten intolerance are not aware that gluten could be the cause of their symptoms. And many conventional medicine doctors do not readily recognize symptoms. Some of the symptoms of gluten sensitivity and Celiac disease can include canker sores, osteoporosis, anemia, cancer, nerve damage, migraines, epilepsy, and autism. Other symptoms include digestive issues such as gas, bloating, diarrhea and, constipation and irritable bowel disease; Keratosis Pilaris, (known as a “chicken skin” look on the back of the arms). This tends be as a result of a fatty acid deficiency and vitamin A deficiency secondary to fat-mal-absorption caused by gluten damaging the gut; Fatigue, brain fog or feeling tired after eating a meal that contains gluten; Diagnosis of an autoimmune disease such as Hashimoto’s thyroiditis, Rheumatoid arthritis, Ulcerative colitis, Lupus, Psoriasis, Scleroderma or Multiple sclerosis; Hormone imbalances such as PMS, PCOS or unexplained infertility; Diagnosis of chronic fatigue or fibromyalgia. These diagnoses simply indicate your conventional doctor cannot pin point the cause of your fatigue or pain; Inflammation, swelling or pain in your joints such as fingers, knees or hips; Mood issues such as anxiety, depression, mood swings and ADD. Celiac disease/gluten sensitivity is not the end of the road for most people. However, if not properly addressed, it will setup a cascade of other serious health concerns. Beginning in the digestive tract, gluten sensitivity produces inflammation in the entire body and is considered a type of autoimmune disease. Celiac disease, which is the chronic and most severe type of gluten intolerance, currently is thought to affect between 1 in 1,750 and 1 in 105 people in the United States. Less severe symptoms of gluten allergy or gluten sensitivity may actually affect as much as one third of the US population. Celiac disease also goes by other names such as coeliac, nontropical sprue, celiac sprue, gluten intolerant enteropathy, or gluten sensitive enteropathy. Cancer is well known as a disease of inflammation as well as a disease of a poorly functioning immune system. Most of us know that up to 80% of our immune system is found in the gut which is where gluten often wrecks the most havoc. Cancer is also a disease of malnutrition. Diets high in gluten will actually crowd out the nutrients from fruits and vegetables that our body needs for health. Due to the Standard American Gluten Rich Diet as well as environmental toxins and the over-indulgence of prescription drugs, many people already have faulty digestion concerns. Celiac disease is also associated with bacterial overgrowth of the small intestine, which can worsen malabsorption or cause malabsorption despite adherence to treatment. As stated above gluten sensitivity can lead to higher risk of death from heart disease and malignancy. And cancer is just one of 55 diseases that can be influenced by gluten. And to add insult to injury, most gluten containing grains are GMO (genetically modified) and contain glyphosates which can also cause digestive concerns that affect the immune system and lead to inflammation. And for those who already have a cancer diagnosis, glutinous grains, as stated above, cause inflammation. Inflammation promotes cancer progression. Caution: Be extremely careful in eating boxed and pre-packaged gluten-free products. There is evidence that suggests you could be risking a future cancer diagnosis and other chronic illnesses due to the high levels of toxic metals found in gluten-free processed foods. The contamination comes mainly from rice flour, already known to contain relatively high levels of arsenic, which is used as a substitute in products such as bread, spaghetti and cereals. Two major studies in the United States revealed that those choosing gluten-free processed foods have twice as much arsenic in their urine as those who eat gluten. Maria Argos, assistant professor of epidemiology in the UIC School of Public Health, and her colleagues looked at data from the National Health and Nutrition Examination Survey searching for a link between gluten-free diet and biomarkers of toxic metals in blood and urine. They found that people who consume gluten-free foods had 70 per cent more mercury in their blood and worryingly high levels of other metals such as lead and cadmium. Why Has the Number of People with Gluten Intolerance Skyrocketed? According to Dr. David Perlmutter, author of the book Grain Brain, the ability of the immune system to recognize friend or foe as far as proteins are concerned is fundamentally regulated by the balance of bacteria that reside within our intestines, our microbiome. With the overuse of antibiotics and other challenges including other medications like anti-inflammatories, and even chlorinated water, the regulation of our gut related immune system can be compromised, and this leads to inappropriate and excessive reactions to what might otherwise have represented a nonthreatening protein like gluten. So disturb the balance of bacteria in the gut, and next thing you know, you are at risk for gluten sensitivity. In addition, the hybridization of wheat has favored both genetic changes in the composition of gluten as well as greatly increasing the amount of gluten found in wheat-derived products (as well as barley and rye). 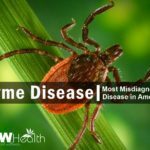 These changes further overwhelm the immune system’s ability to respond in a normal fashion when exposed to these products. 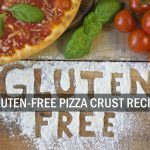 The good news is that going gluten-free along with implementing a very healthy diet is not difficult. Many healthy diets promote eating as close to nature as possible and that is a win-win for your health. A gluten-free diet is linked to many health benefits including weight loss, increased energy, and overall wellness. Because gluten can be found in many processed, canned or bagged foods, be sure to read labels carefully. Below are some healthy eating recommendations for your gluten-free diet. 1) Eat your vegetables and fruits. Some practitioners recommend consuming 13-15 servings of vegetables/fruits each day. Sound like a huge amount? Once we break it down it becomes very easy to do by consuming smoothies, soups, salads, vegetable juice extracting, veggie snacks with healthy dips, etc. Homemade cultured vegetables and even homemade yogurt seem to help many people with Celiac disease. And if you grow your own vegetables, you don’t have to worry about pesticides, herbicides and GMOs. 2) Eliminate Wheat, Gluten and Most Grains – An absolute must to help heal the digestive tract and the immune system. 3) Consume Healthy Fats – Reduce saturated fats. Skip inflammatory oils like canola or corn oil. Instead, reach for alternatives like coconut, avocado, macadamia or extra virgin olive oil. Eat one avocado per day. 4) Reduce and Eliminate Refined Sugar and be very cautious where it hides. Cancer cells uptake sugar at a rate of 12x normal cells which is why PET scans work so well. Sugar is also very immunosuppressive — not only the amount, but also the frequency of ingesting sugar. It takes about 5 hours for your immune system to get back to its normal baseline status after eating sugar and by then, you will probably need another sugar-fix. Sugar is just as addicting as many pharmaceutical drugs. Realize that sugar is in just about all processed foods in some form or another – become a professional label-reader or better yet, dump processed foods and refined sugar. 5) Eliminate Dairy. Cow dairy should be avoided. Even organic. Why? Because one is still getting the hormones of the animal when consuming animal milks – even if it the milk is labelled organic. Proteins in dairy can be confused by the body in those with any type of gluten sensitivity. This is called cross-reaction which then causes inflammation. Substitutes for cow dairy include coconut milk, almond milk, rice milk, hempseed milk. Cooking Methods – First of all I highly recommend throwing out your microwave (don’t give it to someone else – literally throw it away). I understand that it’s convenient and saves times, but it also changes your food. Use a convection oven instead. Lite stir frying, steaming and baking in a convection oven are the healthiest ways to cook. Including raw vegetables and fruit in your daily diet is beneficial to your digestive tract. Keep Your Digestive Tract & Liver Healthy – With the onslaught of environmental toxins, chemical laden and GMO foods as well as the nutrient-poor Standard American Diet, it’s the digestive tract and liver that suffers the most abuse. While your body contains many self-healing mechanisms, it can easily go on toxic overload with the beginning of health concerns and even disease not far behind. I highly recommend performing both a colon cleanse and a liver-gallbladder cleanse two times a year. Probiotics and Prebiotics – Researchers have experienced success in the ability to reduce the symptoms of different digestive issues using available strains of beneficial probiotic bacteria. During a 2010 study at the National Spanish Research Council in Valencia, Spain, scientists created an artificial small intestine and synthesized the internal effects of the disease. Researchers reported that experimentation with a variety of probiotic strains showed great potential in improving the resilience of intestinal tissue, as well as reducing the immune system’s overall hostility towards it. Although real world human medical trials are still needed, the use of the probiotic bifidobacteria, specifically, appears very promising as a long term option for those with celiac disease. Did you know that gluten actually ages the body? Fructose and galactose undergo glycation at about 10 times the rate as glucose. Considering the dramatic increase in sugar consumption over the past several decades, and the subsequent increase in fructose consumption (most sweeteners are approximately 50% fructose), is there any question why we’re seeing rising rates of heart disease, arthritis, and other inflammatory “diseases of aging”? Keep your blood sugar low by eating real foods which will reduce sugar supplies available for glycation. Over the last 20 years the average yearly sugar consumption per person in the United States has gone from 26 pounds to 135 pounds! Eat organic vegetables and organic fruits raw, boiled, or steamed. It’s good to know that eating raw does not produce formation of these compounds because there is no cooking, while boiling and steaming introduce water to the cooking process. Avoid processed carbohydrates and browned foods. 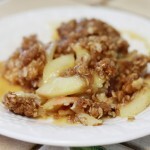 Big Food manufacturers take steps to increase caramelization and browning in their foods which directly increases the levels of AGEs in the foods. Cook free-range meats low and slow. Higher temps produce more AGEs than lower temperature, longer cooking times. Rare and medium-rare meats will have fewer AGEs than fully cooked meats. Stay Hydrated. Drink purified water. The greatest sources of excess sugar for many people are soft drinks. Switching to purified water eliminates this potential contributor to the formation of AGEs while providing a host of other health benefits. Did you know that a 2% drop in your body’s water supply can trigger signs of dehydration such as short-term memory problems, trouble with basic math, and difficulty focusing on smaller print? If you’re having a difficult time reading your email or text messages, possibly you need a glass of purified water more than a new pair of glasses. Supplement with pyridoxamine a form of Vitamin B6. Vitamin B6 has three forms: pyridoxal, pyridoxine, and pyridoxamine. It is this last form that has been clinically shown to be a natural inhibitor in the formation of Advanced Glycation End products. Vitamin B6 is used for many actions in the body, and is involved in more than 100 enzyme functions, mostly associated with protein metabolism. When supplementing with a single B-Vitamin, it is also important to include a B-Complex containing all the B vitamins. Stop smoking. Recent research has clearly shown a significantly higher level of serum AGEs in smokers and especially diabetic smokers. In summary, gluten’s relationship to Celiac disease and cancer needs must always be kept in mind. The good news is that the implementation of a very healthy diet and lifestyle changes go very far in supporting your body’s natural healing abilities. Not everyone can or will go cold-turkey and it’s okay to make these diet and lifestyle changes one-step-at-a-time as you climb your own personal nutritional and health ladder. God gave you one mouth and 4-5 (men 4 and women 5) elimination routes, thus your body can be very forgiving…for a time. The key words are “for a time.” It is imperative to understand that everyone has a toxic threshold. If you are already experiencing a chronic disease, I encourage you to begin to make changes as quickly as possible. Chances are you will begin to see some results quickly. Never give up! 11. Moreira PI, Smith MA, Zhu X, et al. Oxidative stress and neurodegeneration. Ann NY Acad Sci. 2005 Jun;1043:545-52. 12. Baynes JW, Thorpe SR. Glycoxidation and lipoxidation in atherogenesis. Free Radic Biol Med. 2000 Jun 15;28(12):1708-16. 13. Schleicher E, Weigert C, Rohrbach H, et al. Role of glucoxidation and lipid oxidation in the development of atherosclerosis. Ann NY Acad Sci. 2005 Jun;1043:343-54. 14. Asif M, Egan J, Vasan S, et al. An advanced glycation endproduct cross-link breaker can reverse age-related increases in myocardial stiffness. Proc Natl Acad Sci USA. 2000 Mar 14;97(6):2809-13. 15. Spiteller G. Is atherosclerosis a multifactorial disease or is it induced by a sequence of lipid peroxidation reactions? Ann NY Acad Sci. 2005 Jun;1043:355-66. 16. Athar M. Oxidative stress and experimental carcinogenesis. Indian J Exp Biol. 2002 Jun;40(6):656-67. 17. Valko M, Izakovic M, Mazur M, Rhodes CJ, Telser J. Role of oxygen radicals in DNA damage and cancer incidence. Mol Cell Biochem. 2004 Nov;266(1-2):37-56. 18. Abe R, Shimizu T, Sugawara H, et al. Regulation of human melanoma growth and metastasis by AGE-AGE receptor interactions. J Invest Dermatol. 2004 Feb;122(2):461-7. 19. Yamamoto Y, Yamagishi S, Hsu CC, Yamamoto H. Advanced glycation endproducts-receptor interactions stimulate the growth of human pancreatic cancer cells through the induction of platelet-derived growth factor-B. Biochem Biophys Res Commun. 1996 May 24;222(3):700-5. 20. van Heijst JW, Niessen HW, Hoekman K, Schalkwijk CG. Advanced glycation end products in human cancer tissues: detection of Nepsilon-(carboxymethyl)lysine and argpyrimidine. Ann NY Acad Sci. 2005 Jun;1043:725-33. 21. Boldyrev AA, Stvolinsky SL, Tyulina OV, et al. Biochemical and physiological evidence that carnosine is an endogenous neuroprotector against free radicals. Cell Mol Neurobiol. 1997 Apr;17(2):259-71. 22. Wang AM, Ma C, Xie ZH, Shen F. Use of carnosine as a natural anti-senescence drug for human beings. Biochemistry (Mosc.). 2000 Jul;65(7):869-71. 23. Yuneva MO, Bulygina ER, Gallant SC, et al. Effect of carnosine on age-induced changes in senescence-accelerated mice. J Anti-Aging Med. 1999;2(4):337-42. 24. Guiotto A, Calderan A, Ruzza P, Borin G. Carnosine and carnosine-related antioxidants: a review. Curr Med Chem. 2005;12(20):2293-315. 25. Hipkiss AR, Michaelis J, Syrris P. Non-enzymatic glycosylation of the dipeptide L-carnosine, a potential anti-protein-cross-linking agent. FEBS Lett. 1995 Aug 28;371(1):81-5. 26. Hipkiss AR. Carnosine, a protective, anti-ageing peptide? Int J Biochem Cell Biol. 1998 Aug;30(8):863-8. 27. Gallant S, Semyonova M, Yuneva M. Carnosine as a potential anti-senescence drug. Biochemistry (Mosc.). 2000 Jul;65(7):866-8. 28. Kohen R, Yamamoto Y, Cundy KC, Ames BN. Antioxidant activity of carnosine, homocarnosine, and anserine present in muscle and brain. Proc Natl Acad Sci USA. 1988 May;85(9):3175-9. 29. Hipkiss AR, Preston JE, Himswoth DT, Worthington VC, Abbot NJ. Protective effects of carnosine against malondialdehyde-induced toxicity towards cultured rat brain endothelial cells. Neurosci Lett. 1997 Dec 5;238(3):135-8. 30. Preston JE, Hipkiss AR, Himsworth DT, Romero IA, Abbott JN. Toxic effects of beta-amyloid(25-35) on immortalised rat brain endothelial cell: protection by carnosine, homocarnosine and beta-alanine. Neurosci Lett. 1998 Feb 13;242(2):105-8. 31. Jandeleit-Dahm KA, Lassila M, Allen TJ. Advanced glycation end products in diabetes-associated atherosclerosis and renal disease: interventional studies. Ann NY Acad Sci. 2005 Jun;1043:759-66. 32. Liu J, Masurekar MR, Vatner DE, et al. Glycation end-product cross-link breaker reduces collagen and improves cardiac function in aging diabetic heart. Am J Physiol Heart Circ Physiol. 2003 Dec;285(6):H2587-91. 33. The Dark Side of Wheat, Sayer Ji, GreenMed Info, 2014. 34. Federation of American Societies for Experimental Biology. Gut bacteria offer new insights and hope for people with celiac disease. ScienceDaily. 2010 May 1.